Louisiana Coalition Against Domestic Violence (LCADV) tracks domestic violence homicides primarily through media reports. The data is compiled in a spreadsheet to monitor yearly trends, to inform the Coalition’s public policy work, and to confirm the accuracy of external reports.This is not a memorial list. It is a compilation of homicides based on criteria set forth by the Louisiana Domestic Violence Fatality Review Project. All homicides in which the victim was a current or former intimate partner of the perpetrator. Homicides in which the victim was someone other than the perpetrator’s intimate partner, but which occur in the context of domestic violence or in the context of a perpetrator attempting to kill an intimate partner (i.e., friend, family member, new intimate partner, law enforcement). Homicides occurring as an extension of or in response to ongoing intimate partner abuse (i.e., revenge killing of children). Suicides, other than the abuser’s, which may be a response to domestic violence. 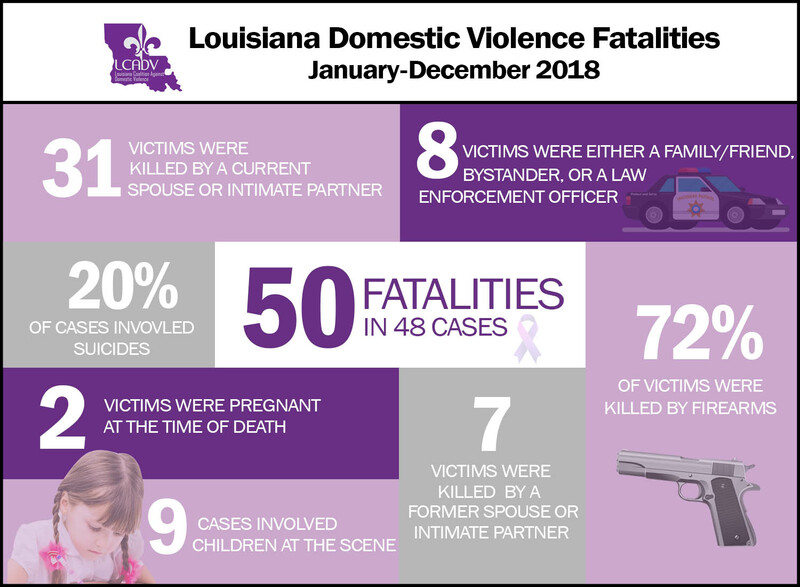 In 2005, the Louisiana Domestic Violence Fatality Review and Tracking Project was created to address the need for a community-wide analysis of the existence of systemic gaps that hinder victim safety and perpetrator accountability. Download the report here. For more information on our fatality tracking project, contact us. According to the Violence Policy Center report, When Men Murder Women, in 2018 Louisiana ranked 2nd in the nation for the rate of women murdered by men. To read the report click here.